About Us - Spread Pizza Restaurant –Pizza, Chicken, Ribs, Sandwiches, Salads and more! Spread Pizza is a Chicago based restaurant. 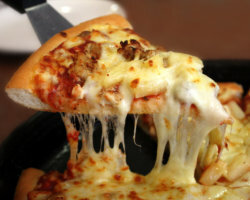 Spread Pizza started from the idea of running a large franchise. Spread Pizza Restaurant is located at 4105 west 147th street with the vision to spread all over the United States and beyond. Spread Pizza will spread as the name implies. Spread Pizza was started in Chicago on May 6th 2017 by Nneka Green. You cannot come into Spread Restaurant without finding something to eat from our array of delicious cuisine. Whatever your craving is, we have it. Period. Enjoy our fresh salads, delicious pizzas, ribs, chicken, burgers, and unusual carefully prepared yummy fries. Most dishes are made from scratch with only the freshest ingredients. Don’t forget our mouth watering dessert! We offer a variety of beers, wines and high end champagne. We want you to enjoy high quality food at reasonable prices, unparalleled personal service and attention to details by our dedicated staff. The restaurant features an open bar area which seats more than 30 guests and an enchanting dinning room for more than 40 guests. You will find that our shoot out patio provides the perfect environment for you to relax with your family and friends to enjoy one of our delicious watering cuisines and drinks. Spread Pizza Restaurant is truly the best choice that you can make. For inquiries, you may reach out to us via phone 708-926-9491 or via fax 708-926-2341 or email spreadpizza@gmail.com.